This past week, I made a mistake that cost me money. The funny thing is that it was not a huge mistake by any means…just a small oversight that was caused by not taking that extra couple of seconds to make sure everything was in line and ready to go. This story starts with Black Friday. Like I pointed out in an earlier post, I take great care in timing my Black Friday promotions so that my cookie will be recorded within affiliate programs when my readers start buying their products online (read how I do this here). By planning ahead and timing my articles correctly along with timing an email to my newsletter subscribers through Aweber, I am able to capitalize on large buying days and sales throughout the year. That is…of course…minus this one mistake. 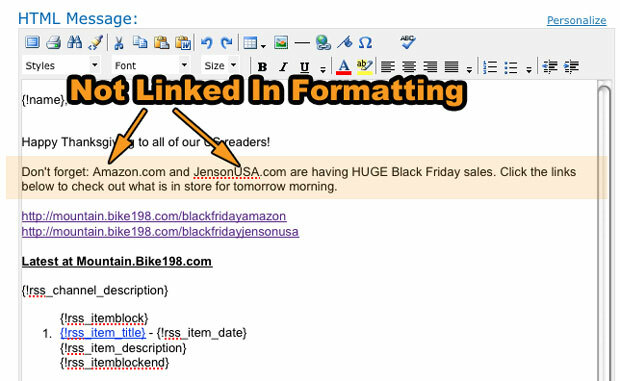 Just before Black Friday, I wanted an email to go out to my newsletter subscribers on Bike198.com that they were already used to that provided value and contained my affiliate links to setup for Black Friday. I had timed everything perfectly so that a blog broadcast email was going to hit on Thanksgiving morning just in time to record the Amazon cookie for the next 24 hour period of buying. The blog broadcast feature in Aweber is the source of my highest traffic days and those emails see the best open rates out of anything I send out. It was the perfect way to promote my articles and Black Friday deals. I used a method that I have previously outlined on this blog (article: Are you leaving serious money on the table?) and edited above and below my blog broadcast feature through Aweber to include reminders to check out the Black Friday deals on Amazon and the largest online bike retailer JensonUSA as you can see below. As you can see by the screenshot above, everything was set and ready to go. However, I only linked my affiliate account to the links you see underlined and left the brand names of the online retailers untouched and unlinked. Not giving it a second thought, everything looked good to go at first glance and I set the email to blast out to my newsletter subscribers. As the email when out, I started tracking clicks, open rates and responses on the blog just as I would with any other broadcast email. When I went into my email inbox to delete all of the “out of office” responses and check for any reader responses, I noticed something strange. As you can see in the screenshot above, the Amazon and JensonUSA links are linked to the online sites, but they are not linked via my affiliate link…they are linked to the respective homepages! Worse yet…they are the first two links in the email! What I forgot as I was drafting up my email for release was that most email applications will automatically link anything with a .com, .net or .org within the email body. This means that anything you put with an ending will not give you credit for the referral and subsequently not give you any affiliate sales. My readers clicked on those links, bought items from the online stores and I did not receive commission all because I put the .com ending on the brand names in the email without linking them up with my affiliate link. So…like I alluded to earlier…stupid small mistake that ended up costing me a large sum of money. Did readers still click on the other links and purchase? Of course, but the amount of income I brought in during this 48 hour period would have been higher if I would have taken one more step and made sure everything was in line. I write this article hoping that it helps other bloggers out there but it is also done for a self reminder to slow down to dot my eyes and cross my t’s. Is it the end of the world? Absolutely not…what I learned from this little mistake has me better setup for the future and hopefully my experience can help you guys not make the same mistake. So as Miles Davis says…”Do not fear mistakes. There are none.” We learn from our experiences and apply that knowledge to the future. Products Mentioned: Aweber and I use PopUpDomination to grow my newsletter subscriber list. That’s a bummer dude. Thanks for the tip, I’m sure it happens all the time. Tanks for the great article and key things to watch out for! That is a bummer that you could of made tons of money from your links. I’m sure you won’t make the same mistake twice. Life is just a learning lesson. You mess up and you learn from your mistakes. Ouch, that’s painful to read. Wow! So many things we have to keep up with as internet marketers LOL. Sorry to hear you missed that one, I am scared to look back to see if that has happened (more like how many times it has happened LOL) to me. Anyway, knowing you I bet it won’t happen again! Good reminder, thanks for taking the time to post about this little mistake. I’ll make it a habit to scan the actual links and/or HTML in future newsletters.